The Drager HPS® 4500 is a traditional half-shell helmet with a modern design. Its robust outer shell provides you with excellent protection against impact and extreme heat. With a modern visor design, the helmet has superior wearer comfort due to ergonomic and lightweight internal components. A comprehensive range of accessories make our solution a truly versatile helmet across a variety of applications. The outer shell is characterised by a robust and resistant design. The combination of high-temperature-resistant Duroplast and latest aramid fabrics protects you both against falling debris and the heat of naked flames. The outer shell, pressed using a special method (SMC* method) provides the HPS® 4500 with exceptional stability. At the same time it is one of the lightest helmets of its class and meets the requirements of the new standard EN 443:2008 - type A (half shell). 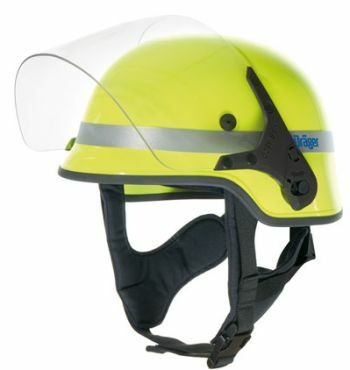 The HPS 4500 features modern and comfortable internal helmet components. The 4-point harness can be adjusted both in the neck area as well as in the temple area via a simple tensioning system. The convenient adjusting wheel allows you to adjust the fit of the helmet even with thick gloves. The integrated hair net allows for height adjustment, and at the same time, ensures a comfortable cool climate inside the helmet. The harness made of fire-resistant Nomex®/aramid fabric and the sweatband made of eco-leather are washable using common detergents. The large visor of the HPS 4500 reaches down to the chin area. It is made of thermally high-resistant Polyphenylsulfon material and therefore suitable for interior fire fighting. The visor is approved according to EN 14458 and classified as "face guard". Therefore the visor provides the greatest possible protection without any interfere in your field of vision. The visor has anti-scratch coating on both sides. Comprehensive accessories for every challenge. Drager offers you a wide range of accessories for the most varied applications during fire fighting. You can optimize and individualize your helmet to these various challenges by choosing between numerous versions of neck guards, face protections, helmet lamps and communication systems - all of which can be quickly and easily attached to the HPS 4500. * SMC (Sheet Molding Compound) - Duroplast, reinforced with aramid fibre cloths; for a higher performance of the entire helmet.